It’s Pi Day!!!!!! This is one of my personal favorites because it combines being a nerd and eating dessert. You can bet I’m much more into the pie than the math, but I’m fully in favor of stuff that smart people like. When I get to stand next to them, does it make me seem smarter by association? I certainly hope so. How many digits of pi do you think my husband can recite? Perhaps we should take bets on that. 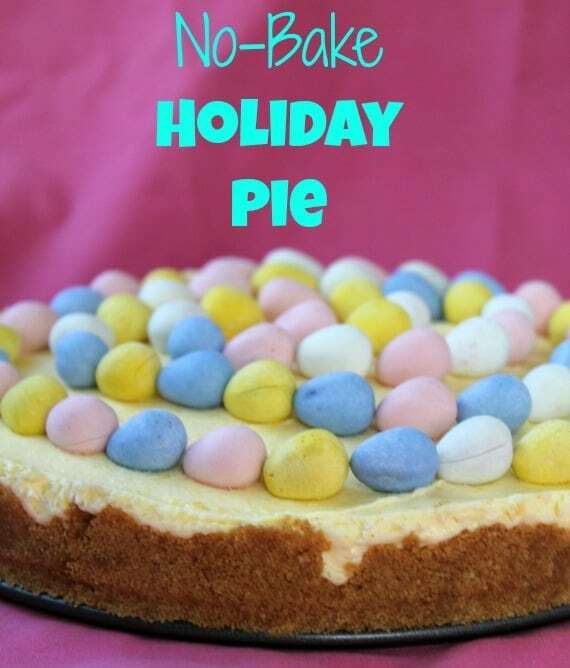 I made a no-bake holiday pie that you can easily customize for any special occasion. Just pick your favorite colorful candy to top it off. This pie is a simple combination of cream cheese, condensed milk, vanilla pudding, and whipped topping inside a buttery graham cracker crust. 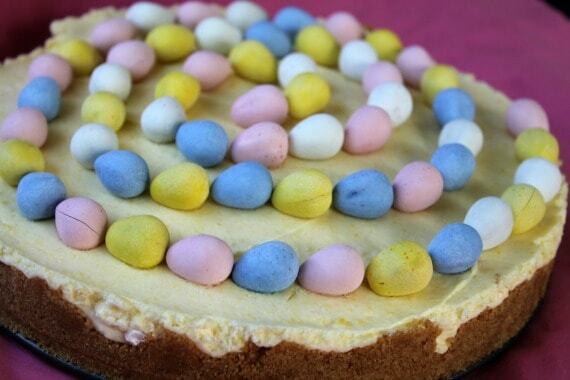 I used Cadbury mini eggs on this one. 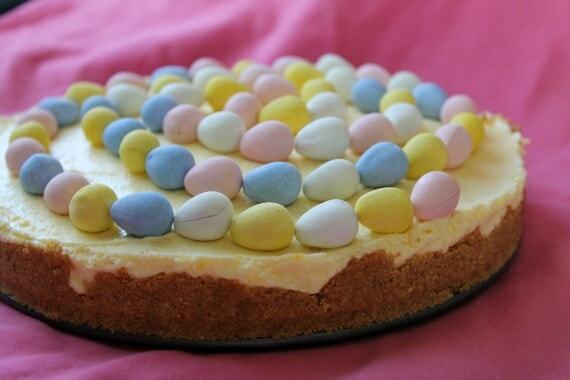 I think Cadbury mini eggs can make just about anything awesome. The whole thing came together in about 20 minutes. There’s just that little matter of letting it refrigerate for 4 hours before you get to eat it. I don’t really remember anything from high school geometry, but I think you can use pi to figure out the precise size of your pie. Or you can just eat all the pie and let someone else do the math. Either way, you should definitely enjoy a slice of pie today. It’s the right thing to do. Smash up your graham crackers into crumbs using a food processor or a zip top bag and something heavy. Combine the crumbs and the butter and press into the bottom and slightly up the sides of a 9-inch springform pan. Put this in the fridge while you get on with your pie. In a large mixing bowl, beat the cream cheese with an electric mixer until smooth. Slowly mix in the condensed milk. Next add the water and the pudding mix and beat until smooth. Finally, fold in whipped topping with a rubber spatula. Keep working at it lightly until fully combined. Transfer the filling into the crust and smooth out the top with a butter knife or offset spatula. Top with your favorite candy and refrigerate for at least 4 hours before serving. sorry to be such a stickler, but do I use sweetened condensed milk or evaporated milk? Just asking. I didn’t know there was such a thing as unsweetened condensed milk. Now that you’re retired, you’ll have all kinds of time to make pie! I am all over that decoration. Cadbury Eggs rock. And no bake too! It’s almost embarrassingly easy. Thanks for stopping by!